The font used for this laundry detergent is of a type often seen in packaging and advertising: kind of minimalist looking, with a lot of the ornateness streamlined down and some details (such as the little round “heads” that most consonants have) eliminated altogether. I’m guessing that modern western fonts are an influence, and in fact some of the letters have been tweaked so that they more closely resemble specific letters of the Roman alphabet. 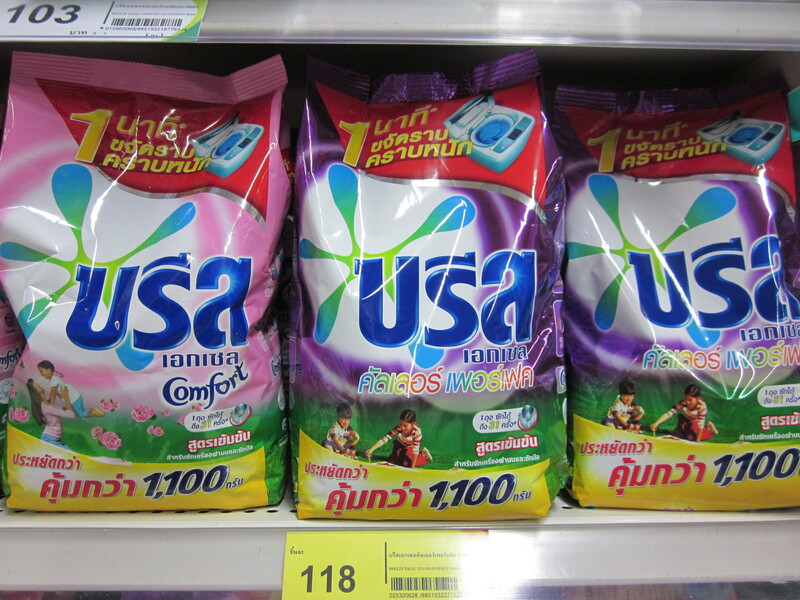 It may look like “usa”, but the brand is actually บรีส. This entry was posted in English, language interference, language learning, Thai language, words, written Thai and tagged packaging, second language acquisition, Thai fonts, Thai letters on 10 November 2014 by adamf2011. How weird…! Yet another dimension of the thousands of T-shirt slogans seen all across Europe featuring nonsensical English. Same in Asia, I bet. The thing that I sometimes see that really gets my attention is Thais wearing T-shirts with (English) profanity on them. Sometimes it’s like some old grandmotherly type, her shirt emblazened with the well-known “four letter” words…if only they knew! It just reinforced my decision not to ever wear anything with non-English writing on it, even if it does look really cool. เหมือนสวยมาก, น่าสนใจด้วย! That font manages to be both ornate and very readable at the same time…I’ve been browsing through some of the other fonts on the site, they’re really cool too. I really like the Thai alphabet, and it seems to me that the forms of the letters can vary from one font to another to a much greater extent than English letters.